Before coming to culinary school, I considered myself to be an "experienced" foodie, to the point of becoming snobbish, among my circle of friends. That’s not necessarily a bad thing, right? I just have higher expectations to how my food should come out of the kitchen and served in front of me. Aren’t all foodies a little snobbish? I know how most dishes were supposed to taste, to look, to smell, to feel, and to sound by appealing to our five senses. You’re probably wondering about the "sound" sense—have you had Chinese sizzling platters (铁板烧) or teppanyaki? They are supposed to be sizzling when served to you; that same sound you hear every time Hell's Kitchen goes to commercial break. I've been in school for a month and I noticed that my food perceptions have changed whenever I dine in. I really nitpick at everything on my plate—from the presentation to all the elements on the plate or bowl. Does everything on the plate have a purpose? Do all the ingredients complement each other? 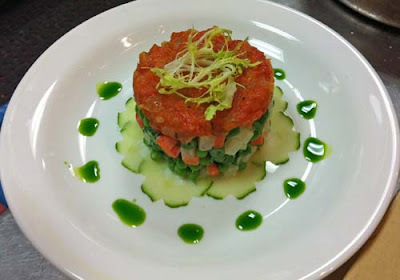 My instructor, Chef Phil, says the way to really test a restaurant’s chefs is to order a salad dish and a fish entrée. For salads, we learned that there are three types—simple, mixed, and composed. A Caesar Salad is a simple salad—one main ingredient that is dressed simply in a dressing. A mixed salad has several ingredients and they are seasoned together, e.g. macédoine de légumes (cooked vegetable salad). A composed salad has a mixture of several ingredients seasoned separately and then presented together on one plate. 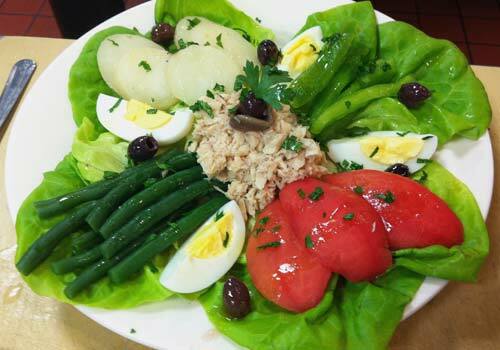 The classical French salade Niçoise is such an example of a composed salad. When preparing the salad, the salad greens should be healthy, dry, and not be bruised. For the dressing, too many elements can cause it to become overpowering and it may cancel out flavors in the salad. It is important to select ingredients in the salad greens and in the dressing to complement each other. The flavor of the main salad ingredient should be enhanced by the salad dressing, not masked by the dressing. I had lunch at a well-known hotel in Midtown last week and I had a Manhattan clam chowder soup, a beet and goat cheese salad, and a ham and Swiss sandwich on ciabatta bread. I ordered the beet and goat cheese salad because we had already made it in class so I knew how it was supposed to taste/look/smell/feel. If I had made the salad, I wouldn’t have drowned it in dressing. In school, we learned to take a spoonful and slide it around the edge of a stainless mixing bowl and then toss it with the salad greens. The beets were not tender in the center so that told me that they should have been cooked in the oven a little longer. Also, I would have liked the vinaigrette to be a little less acidic. The sharp tang wasn’t too pleasing. However, I did enjoy the clam chowder and sandwich. Ron has lived in Beijing, Toronto, Hong Kong, and the state of Texas (Plano and Austin) before coming to The International Culinary Center to study in The French Culinary Institute's Classic Culinary Arts program. He is inspired by the cuisines from different cultures and loves to travel. When Ron is not Yelping or passionately learning new skills and techniques in class, he is updating his food blog, Cooking with Strawberry Tsunami.